A diverse collection of instrumental compositions for guitars and basses including synthesizer, sax, flutes , drums, percussion, and real world sounds influenced by Film/cartoon soundtrack, Meditation and Jazz. Okay, Okay, Okay, with so many people coming to this page to see and hear "WHAT IS THIS?" it's probably time to write something, finally. This is an ART project. INSTRUMENTAL stuff. If you have a rotation player where you can put a bunch of discs on random selection, you will really like this. If you like to sit down and relax at the end of a hard day this CD will send you through some changes. You my need a bottle of scotch. The cover painting is from a dream I had in 1974. No, I was straight at the time and not on acid. For some reason this dream had such an impact on me that when I awoke I had to get it down. Don't ask me to explain it - it is what it is. Some wide eyed duck looking thing with one stilt leg and these blood red drops falling out of the sky. I know, weird. Musically, It spans a great uncharted territory. The first song on this CD is one I wrote while I was still in High School. I still like it. It has had many incarnations. This one is acoustic guitar and drums only. NOT POP MUSIC. You know, I don't know what ever possesses people to make this kind of music. 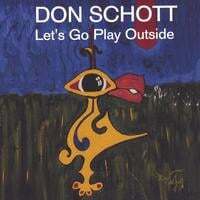 LET'S GO PLAY OUTSIDE will never get played on more than one radio station at a time (mostly those NPR non commercial types) and no kid in his right mind with a guitar under the bed will ever want to emulate this style. But, I like it. I had received this ARTS GRANT from the City of Cincinnati to help me produce this project. Now ARTS subsidies I thought were a waste of public money (ever since that guy pissed in a jar and put a crucifix in it) and always felt that like other forms of business that good artists would be compensated for good work and AFFORDABLE ART was a good way to share ones vision with as many people as wanted to share it. BUT - MUSIC listeners in general; and especially those who are listening to commercial radio like some sort of religious practice - ARE MORE MINDLESS THAN AVERAGE CONSUMERS. It also seems that people are encouraged to be the SAME. Not separate individuals with separate feelings and experiences. Clones or robots or something.. why can't you be like all the others? I gave up watching TV back in 1985. It seems that nobody is into stuff that they themselves enjoy but give in to whatever peer pressure besets them. So much for INDIVIDUALISM. Anyway, back to talking about this CD I made. The next track (no, they are not all ten minutes long) comes from the fact that I like this Scandinavian guitarist names Terje Rypdal. I wanted to create something that was in the style that was close to one of his projects. I had a band that played some of the songs from the songs from that CD and even though only the drummer was in that band (short lived I might add because it was not heavy metal) I managed to capture this event and save it for the CD. Sometimes, when you are composing you go to this place. A place where only one could describe it in music and not in words. I think of these as SOUNDSCAPES and are kind of an IMPRESSIONISTIC auditory experience. Several of the other tracks on this CD are like this. I have another LP (soon to be a CD) that has this kind of stuff on it as well. It's called RA CAN ROW. It sold fairly well back in 1982 on a WORLDWIDE basis. I think it actually paid the bills. Anyway, to get back to this CD, the third cut is still one piece of sound that I listen to and think - WOW that is beautiful. It is kind of like sitting on a mountainside for several hours and letting the cares and problems of your life drain out of your body. Just being. It's mystical and if there was one track that I made and wanted the world to hear this would probably be it. This one or track number seven. The last two tracks are more archive pieces that I've always wanted people to hear and are probably not related to some of the "space is the place" kind of feeling you get from some of these other ones. Oh, Hopi was a small puppy dog when I wrote this (track 8) and if you could imagine this small puppy experiencing its first snowfall and jumping and twirling all around and nipping at the snowflakes as they fell - you would get the full picture. Hey, If you like this and your record collection has a gaping hole in it for this style of sound then you should buy it. I mean it. BUY THIS ONE, you NEED it. GO ON AND BUY IT. GO AHEAD AND BUY IT. Yeah, That's right. Do it. Wouldn't it be strange if we all had the exact same art hanging on or walls?